Feed systems 24” parts feeders orient a wide range of cap sizes and types as well as small jars, containers, and various parts with its patented smooth and gentle operation. Feed Systems Model FSRF-24 Stainless steel Patented Rotary Cap Feeder utilizes a minimal amount of air to assist in orientation. Parts are to be oriented in an open side up position. Stainless steel construction, fully adjustable from 13mm diameter to 70mm diameter for all flat caps, or similar parts where the diameter is greater than the height, quite operation, no change parts, no skilled personnel required, clockwise rotation, two year guarantee, DC motor with speed controls. Model FSRF-24 and Model FSRF-36. No change parts required for standard caps and similar parts. Handles caps and parts from 8mm up to 120mm in diameter. Can orient jars and small containers. 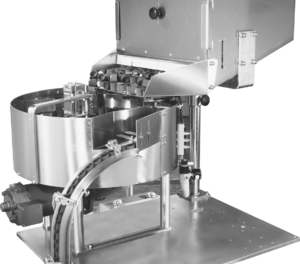 Stainless steel construction--ideal for pharmaceutical and food applications. One model cap feeder can handle standard, tall, child safety, pilfer evident and snap caps; both metal and plastic. Electronically controlled variable speed drive. Compact size with high speed output. Minimum adjustments required for orientation of unusually shaped caps or parts. No skilled personnel required for fast changeovers. Eliminates costly downtime. Optional mobile floor stands, parts counters, stainless steel supply hoppers, stainless steel chutes and bulk parts elevators available. Guaranteed for 2 full years--the longest in the industry. Easily adaptable to KAPS-ALL® cappers. No belts or drive chains needed. Simple tooling available for unusual cap stylings and parts such as; tall spouts, snip tops, push-pull caps, etc. Precise dribble feeding from hopper not required, feeder is not load sensitive. Supplies caps/parts on demand only.